Our 4-Quart Stainless Steel Presto pressure cookers can help you prepare fantastic meals in one-tenth the time! 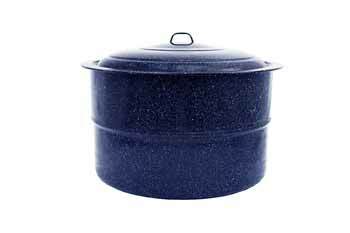 They make it easy to cook large quantities of your family's favorite foods. 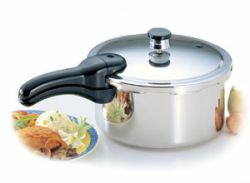 This 4-Quart cooker features an easy-to-clean stainless steel construction with a bimetal-clad base for lasting beauty. These features ensure fast, even heat distribution, and a cover lock indicator that, at-a-glance, shows if the cooker is pressurized. A pressure regulator weight automatically maintains the correct cooking pressure, making cooking easy. 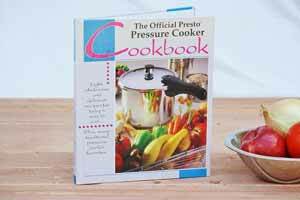 You will be sure to love our 4-Quart Stainless Steel Pressure Cooker from Presto. Note: Handles must be attached to the cover and pot before use. KI have had my Presto 4 quart pressure cooker for about 25 years! I have only replaced the sealing gasket a few times and am about to replace it again. I love it and use it all the time in the winter mainly for making beans. Best in its class for quality and price! I've had my Presto 4 qt. Stainless cooker for about 8 years or more and it still looks good and is going strong. For years I made my little dog his food with ground turkey, carrots or sweet potatoes, brown rice and green beans and he lived to be 15 years old. I love to cook one-pot dinners in my Presto cooker and brown rice to store cooked in the freezer that only takes 10--12 minutes. If you're mainly cooking for one or two people, this is the pressure cooker to try! I absolutely love this cooker. Perfect size and still looks great today. I have had mine for 3 years now and still looks brand new. Had one years ago and gave it to my oldest son. Now that all my kids are gone (out of the house) I need a small cooker for quick meals for hubby and I. This was perfect. Thanks for quick shipping. I love it. 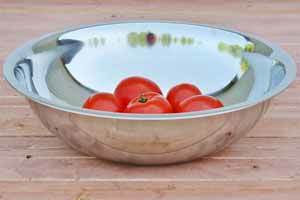 I received my Presto Pressure Cooker in stainless steel, 4 quart. I already had a Presto 8 quart. Excellent service at Red Hill General Store and Pressure Cooker Outlet's websites. I have been unable to find these products locally. It's cooking ability is amazingly fast. Things that normally take several hours to cook (e.g. dry beans) take only 1/4 the usual time, or less. My only complaint is that it's not big enough for large meals to feed a family of 4 - you can't fill it more than 2/3 full. It's best to use for sides or would be perfect for two people. Gaskets are easy to find and work as they should!